Let’s see. I have a million tasks to do today. I’ve got people to see, places to be and you’re talking about living in the moment? Right, who do you think I am, Superman or Superwoman? Can you please come back when I’m not so busy? When I hear about living in the moment, I pretty much think the same thing as I believe many others do. It is for some people, but it sure isn’t for me! Life is just too busy and too complicated and the days never slow down it seems. Unfortunately, I know that if I overextend myself too far and I don’t live in the moment, things will get ugly. I will struggle to handle stress in my day. My emotions will get the best of me and often my temperament will not be socially friendly to anyone. I’ll eventually end up feeling all of this as tension in my body. Living in the moment doesn’t necessarily mean we stop doing what we need to do. It just means we shift how we view our day. Some things honestly are not as important as we make them out to be while there are others that indeed matter. We need to find balance in life. I believe that living in the moment means we are mindful and conscious of our life. We are not on autopilot just living our days as if we have no control over them. 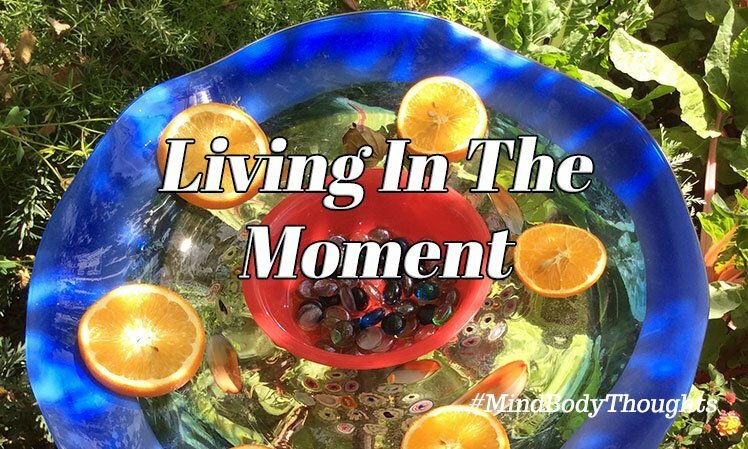 Living in the moment involves us being connected to our mind and body, not only one or the other. Sometimes all that is needed is that we just shift our day slightly. If we prioritize our life and set our focus, we will see more clearly what matters and what does not. When we are mindful and conscious of our day, the best parts of it will rise to the top. We’ll see what is essential without much effort. Living in the moment means that you take stock of what experiences you have lived through and find a way for them to create better experiences for you today. It means you take into account all that exists at this moment and find the best way to build it into something more. Living in the moment is not about selectively enjoying life, but embracing all parts of it. For the more we embrace and reclaim in our lives, the more capacity we have to participate in more profound peace and joy.